The Poloidal Field Coils Winding Facility, where conductor lengths are transformed into large ring-shaped magnets, is the realm of large and powerful tools: tower-like "de-spoolers", a 5-metre-high vacuum test chamber, winding tables that are 17 metres in diameter, and an impregnation station as big as a carousel. Much less visible but no less important to the fabrication process is a humble drill, barely larger than one a dentist might use. Operated by hand, the drill is used to finalize so-called "penetrations"—openings by which liquid helium will flow into the cable-in-conduit conductor. The operation is an extremely delicate one. First, a larger power drill is used to carefully bore a one-euro-size hole into the conductor's steel jacket. Then—using a small hand drill—the technician advances by one-tenth-of-a-millimetre increments until steel foil is exposed. (The foil, only two-tenths of a millimetre thick, is wrapped around the superconducting strands inside the conductor). Throughout the operation the inside of the conductor is placed under pressure so that all metal particles generated by the drill are evacuated. And as a side benefit, the pressure results in a "hissing" sound as soon as the steel foil is pierced, effectively warning the technician to be extra cautious. Because it is of vital importance that the superconducting strands remain unharmed, the technician wields the drill carefully in the final stage of the process to slowly and progressively chip away at the steel foil until the strands are exposed. 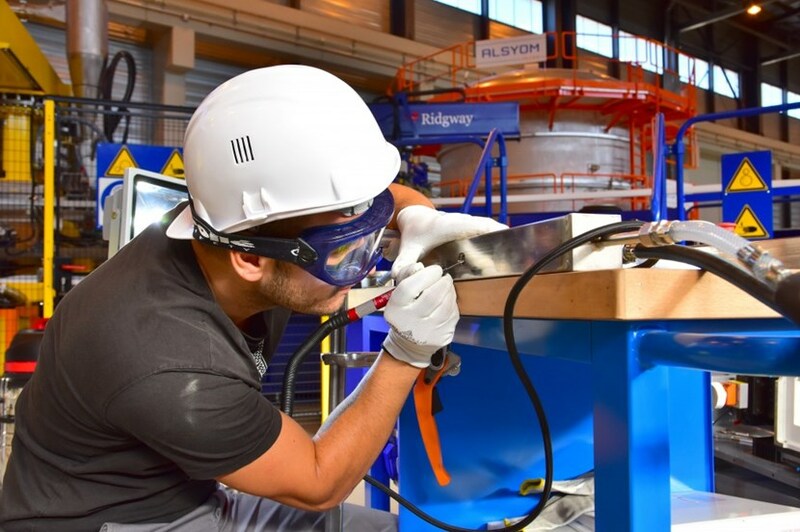 The French company CNIM has been chosen by Europe as the manufacturing contractor in the Poloidal Field Coils Winding Facility, where four of ITER's poloidal field coils will be fabricated. Employees from CNIM have been practising the drilling technique for a few weeks now, and report that they feel comfortable with it. "Two tenths of a millimetre? That is a very comfortable safety margin," smiles André Forestier, the company's foreman on the ITER site. In the long and complex sequence of operations that transforms conductor lengths into poloidal field coils weighing up to 400 tonnes, the quality of the hand drilling job is crucial. Once equipped with a helium inlet, each penetration (eight per coil, on average) forms a most strategic interface between the cryogenic system and the coils.